Proper building sites need proper toys and thanks to Hire Station over in Trafford Park we’ve had some big hitters at Moregeous Mansions to wreak havoc in what was once my garden / home / world. In just two weeks we’ve gone from a slightly battered but relatively normal home to a rubble filled tip to what is now a clay thick mud bath. There isn’t a #BuilderCat in hell’s chance we’d have achieved all that as quickly without hiring the mini-digger and breaker, I am SO glad we did. Instead of having to dig and wheelbarrow all the bricks, mortar, plaster, concrete and earth, everything’s been shovelled up and dumped near the gates for a huge grabber to come and take away. Full credit to Mr M and the lads nonetheless because there’s still been a huge amount of heavy duty clearance required by non-machines, ie. them. 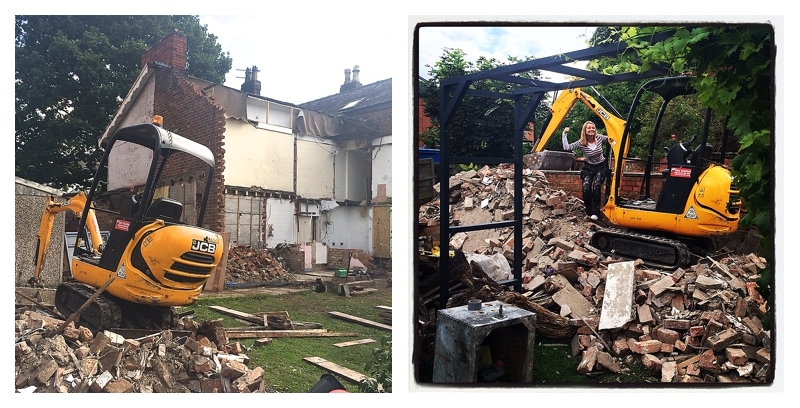 Though having watched him shift rubble this week, I’m starting to think Mr M might actually be a machine. My very own Terminator. 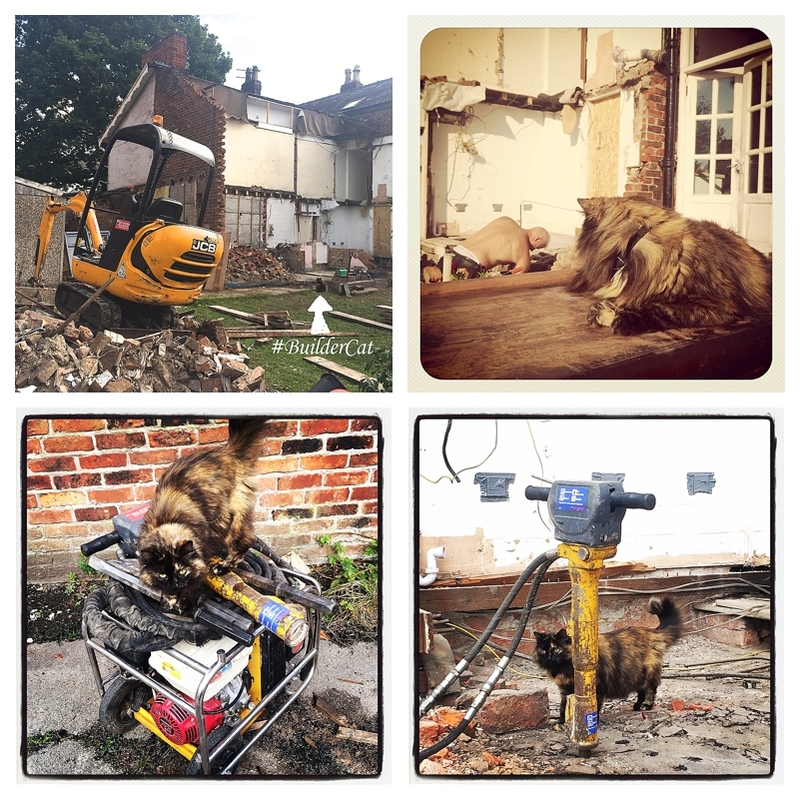 On the subject of #BuilderCats, Missy has pleasantly surprised us with her on site bravery and nosiness. My gorgeous Mia, who was with me through 8 different house refurbs over the years, was fazed by nothing, but I did think Missy, a new addition who has only ever known this house, would freak out as she’s of a more nervous disposition. Oh no. She’s taken it *all* in her filthy pawed stride, keeping an eye on proceedings and insisting on rolling her long hair around in every dust patch available, the dirty gertie. Thank to Dave at our local Hire Station store for being super helpful & not getting bored of my endless questions, he’ll be sick of me by Christmas…..